Is the Veil Now a Symbol of Islamic Feminism? 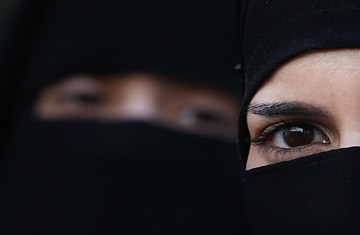 Two women wearing Islamic niqab veils stand outside the French Embassy during a demonstration on April 11, 2011 in London, England. For Muslims immigrants in America, the days following 9/11 were a harrowing encounter with fear-fueled American hate. IPod bearing, second-generation techies faced insults in Silicon Valley parking lots; schoolgirls wearing head scarves were attacked; and mosques across the country were vandalized or set ablaze. For many months, it seemed altogether unclear whether America's Muslims  from the cocktail-swilling secular to the mosque-attending pious  would ever live in their communities without apprehension again. That tense period, the Harvard academic Leila Ahmed provocatively argues in a new book, has turned out to have been a very good thing. Its long term effect has been to remake American Islam, making the country's most conservative Muslims tolerant of criticism and open to a young generation's more liberal demands. The result, Ahmed writes in A Quiet Revolution, is no less than a "new moment in history  in the history of Islam as well as of America." Raised in Egypt in the 1940s and now a scholar at Harvard Divinity School, Ahmed arrives at this conclusion by way of tracing the history of the veil. The bare-headed women of her Cairo girlhood considered veiling an outmoded habit of a repressive past, but by the early 1990s the majority of Muslim women around the world were once again covering up. Ahmed, like most well-heeled Muslims, is initially dismayed by this and sets out to understand why. The story behind the veil's resurgence is not particularly straight-forward: everything plays a role, from British colonialism, the rise of Islamism in the Middle East, Egypt's sclerotic economy, the Arab enmity with Israel, the Cold War and Saudi Arabia's coffers. What Ahmed wants us to understand through this panoramic history is that the veil has gone through the wash cycle of history, and that its meaning today is both fresh and local. It is no longer a bandanna version of the all-encompassing Afghan burqa, signaling a woman's brainwashed submissiveness or at the very least her lack of choice. Today, Ahmed argues, the veil often reflects values and attitudes that have little to do with piety at all. Many young women in post 9/11 America, she notes, began wearing the veil to protest discrimination against Muslims or to express their solidarity with the Palestinian cause. The portrait of post 9/11 Muslim America that Ahmed offers up in her book is strikingly hopeful, full of individuals, trends, and stories that make her case for this new era's promise. There is the feminist translation of the Koran that makes a sound case against domestic violence, the campaigns to move the women's sections of mosques out of basements, the accounts of major conventions where Muslim authorities offer critics a platform to lambast their faith. Ahmed is direct about how this evolution came about: under attack in the era of after 9/11, "Muslims found themselves an embattled minority needing the support of others," she writes. The new openness, she concludes, will be transforming. Even if Muslim authorities and elders are merely putting up a facade of liberality to ward off political attack, the climate is shaping a young generation of Muslims who demand more progressive ways as their due. I moderated a panel with Ahmed in London last month before a sold-out audience eager to hear and challenge her views. The section of her book dealing with the veil and world politics, particularly her position that the modern furor in the West over the veil replays old colonialist rhetoric, resonated with many. Resentment of British involvement in both Iraq and Afghanistan runs high in Britain, and Ahmed taps into that strain of public opinion by noting that saving Afghan women from the burqa became a moral short-hand for the West going to war in Afghanistan. The audience grew sharper and more skeptical, though, when it came to Ahmed's rosy assertion that the veil's resurgence dovetails with a feminist spirit of activism and justice. Some questioned whether it even made sense to discuss the veil so sweepingly when the climates in which women wore it  from Connecticut to Karachi  varied so dramatically in terms of women's political, cultural, and economic status. More than one angry British feminist rebuked Ahmed for trying to honey-coat a covering that to many will always symbolize Islam's patriarchy. The exchanges reflected the veil's reliable ability to lead into passionate argument about more relevant subjects: Muslim immigrants' troubled assimilation in Europe, the wars in Iraq and Afghanistan, and racism. Ahmed's book, and the veil itself, will doubtlessly continue sparking debate. But between the pages, laced into Ahmed's account of the veil in history, the curious will find gems of scholarship and insight. Saudi Arabia's shadow looms long across the book, and the kingdom emerges as the quiet victor in the veil's resurgence, its long-time project to export Wahhabi Islam's more strict ways a global success. Most striking of all, we learn that conservative Muslims, or veiled Muslims for that matter, make up a decided minority in America. The rest are discretely living their lives, either secular or private in their practice of Islam, a silent majority receiving no one's attention. See TIME's photo-essay "Muslim in America." See TIME's photo-essay "30 Mosques in 30 Days."